Teteven Hotel in Teteven Town in Bulgaria. Bookings and Information. Location: Hotel Teteven is situated 5 min. away of the centre of teh town and is a starting point to many interesting tourist routes in the region. 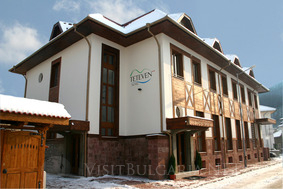 Accommodation: Hotel Teteven offers maximum comfort in 12 rooms and 4 studios. All rooms have cable TV, telephone, Internet connection, safe deposit boxes and modern bathrooms with: bathtub/shower, hairdryer and medical emergency alarm system. Wine & Dine: The restaurant has a unique private and romantic atmosphere. It serves Bulgarian and European cuisine and can seat up to 40 persons. Open-air summer garden is at guests' disposal as well. The hotel also has a lobby bar, offering cocktails and cigars.